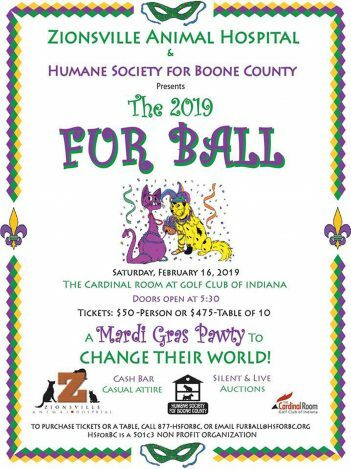 Grab your beads and get ready for some fun at the sixth annual Humane Society for Boone County Fur Ball Mardi Gras Fundraiser. Co-sponsored by the Zionsville Animal Hospital, the event is at 5:30 p.m. Feb. 16 at the Cardinal Room at Golf Club of Indiana, 6905 S. 525 E., Lebanon. The Fur Ball is HSforBC’s biggest annual fundraiser. Last year, it raised approximately $34,000. The organization’s goal is to exceed that total. The evening will feature a buffet dinner, cash bar, updates on building construction and the organization and a live and silent auction. Austin said the event sells out each year because of the love attendees have for animals. “It’s fun, it relaxed, and what else are you going to do in February?” she said. All ticket/tables sales are sold in advance and are $50 per ticket or $475 for a table of 10. For more or to purchase tickets or a table, call 877-473-6722 or email furball@hsforbc.org.